How do I remove stains on my deck. The deck is non skid and the stains came from when I had some work don on the engines they are grease and oil stains. The boat is a 35′ Cabo express 1995 the decks are fiberglass. NO paint. 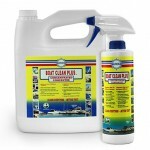 You should be able to get them out with a 50/50 solution of Boat Clean Plus and Boat Scrub and a bit of rubbing. 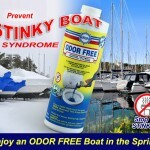 Use a scrub brush on non-skid areas and a Marine Power Mitt on the smooth areas, or try a soft cloth but it will require more rubbing. 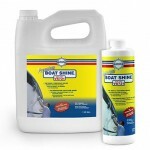 This is the formula that many boat builders use to remove tough stains and yellowing from Carnauba Wax. If all the stain does not come out, let the sun help you. Leave the deck exposed to the sun for a week or two without any protection on the damaged area. When you get the stains out, protect your deck with Sure Step to prevent stains in the future.